Unfortunately that's the kind of thing the NRO get tetchy about so I wonder if we'll ever hear anything about this in relation to this flight. Yep ... just ... yep. Very high apogee... only thrusters have control until reentry interface. Wow and wow. I'm going back to bed, but I doubt I'll sleep much. Going to be some great video footage when it's all edited. Did anyone really expect the ground tracking cameras of the booster in free autonomous flight mode to look so awesome? I certainly wasn't expecting the RCS/attitude control thruster plumes to be so visible. Legs seemed to deploy just 3-4s before the touchdown, as opposed to 10s announced. Given a higher apogee (+20%) is this more an indication of a new mission profile or operating closer to the limits? Thrusters might have operated more frequently due to strong winds at high altitude (mentioned by Elon). It took only 12-14 secs from separation to start of boostback. Well, the engines shut down.. but only briefly at MECO. While the centre engine isn't running, there is a continuous plume (from the turbopump, or is it venting LOX?). The center engine restarts first, probably to to keep the propellant from sloshing during the flip, and probably gimbals to speedup and stabilize the rates of rotation. The remaining 2 engines turn on soon after that. Just wait until a 12m core does that RTLS. Same here... I'm t-minus 1.5 hrs til my normal Monday morning alarm. But that was worth it. 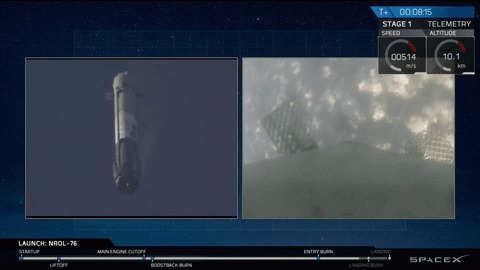 Just wait until first stage sep of a Falcon 9 Heavy with 3 stages coming back! Will there be a post launch press conference this time? Or is that not the norm for a spy satellite launch? They certainly won't have a joint presser with NRO or USAF but I wonder if SpaceX may issue a few press releases and answer a few Twitter queries on the launch vehicle's performance. 1. First stage climbed after MECO from 66 km to 166 km in boost back scenario . 2. below 5 km air resistance slows quite fast the vehicle. Larger flaps in the future will probably enhance this effect. 3. releasing the landing legs almost before landing minimizes fire damage to them from the landing flames.